Sarah has been practicing yoga on and off since high school. She became serious about her practice in 2005, completing her first teacher training in 2009 with Yoga Arts in Bali, Indonesia. Continuing her studies with the Kripalu School of Yoga, Massachusetts, Sarah received the Yoga Alliance 500 hour registration in 2011. She then studied with Noah Mazé of Yogamazé from 2012-2015. Sarah is currently working with Rathna Charitable Trust for several service projects. Blending her past learnings and ongoing studies, Sarah's classes are a mix of creative sequencing and strong attention to alignment. With a deep passion for pranayama and meditation as well as asana, Sarah enjoys sharing her experiences and ongoing exploration of yoga with all levels of students. 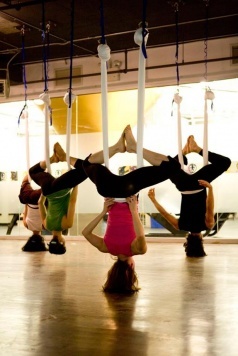 Sarah also teaches Aerial Yoga, and studied with both Anti-Gravity Fitness and Unnata Aerial Yoga. Sarah is registered with Yoga Alliance at the E-RYT 500 level. This is an intensive training for Yoga teachers and serious practitioners only. Learn the basic grips, wraps and traps to create a well rounded practice. The session will include inversions, backbends, forward bends and hip openers at the basic level. Explore back bends using the aerial hammock and how to use the hammock to prepare for mat asana back bends. Practice will include traditional back bends, including urdhva dhanurasana (upward bow pose) and its variations, from the mat as well as the hammock. Expect to take your back bend to a deeper level with ease. The hammock is a great prop for deepening a forward bend practice. The four pillars of pascimottansana (west facing pose) will be explored in this session. The practice will finish with deep seated forward bends on the mat. In this session we will explore moving energy through the chakras using pranayama and meditation techniques while in the hammock. Practice will end with an extended meditation on the chakras. With the hammock lowered to just above the floor, we will relax with an extended aerial restorative practice. The weekend intensive will close with an extended meditation. Booking: Required, limited seats guaranteed upon 100% payment of workshop fees on first come first serve basis.